I'm Unschooled. Yes, I Can Write. 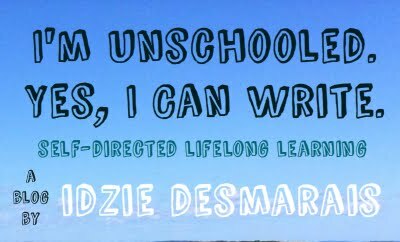 : Unschooling: Are We Teaching Ourselves? Thank you! This is one of the best descriptions I have seen of unschooling. Thanks! I'm leaning more and more toward unschooling for my kids. I love watching how my almost four-year-old picks up on everything, and asks questions about everything. There's no stopping his knowledge acquisition. No need to "start" homeschooling, when his learning has been happening since before he was born. @Bev: Thanks so much, I appreciate you saying that!! @BennyHadrianMum: Learning really is something that happens all the time. Wishing you the best of luck in your life learning adventures! Just discovered your blog, and I like this post. I think it describes unschooling well. I think unschooling can be hard to pin down and can be hard to commit to as a parent, but when you do it just works so well. Thanks for putting this information out there. Thank you for this blog. it is absolutely wonderful! I have been on the journey towards unschooling with my children for the past 23 years. I began as a "homeschooling" mother of a son who I removed from the public school system because of his inability to conform to their standards. He was labeled as having an attention disorder and was referred to as a "non-reader and non-speller" at the age of 7. I thought I would do it my own way for a while, get him on track and then he would return to school. That never happened. He is now 23 years old and in college aspiring to be a writer and editor. I will never regret my decision. I have seven children now. My second oldest, who is now 16, CHOSE high school last year. He is an athlete who is working toward a professional career and scholarship in baseball. Participation in high school athletics is not available to "homeschoolers" in our state of Maryland so he decided to give school a try. It worked out well for him although, it has been an adjustment for me! After being unschooled for his entire life and never taking a written test, he gets all A's and B's in his academics and made the varsity baseball team as their starting catcher. Not too shabby. All the rest of my children are still learning at home. My 12 year old daughter has danced for a private studio since age 3 and is considering auditioning for The Baltimore School for the Arts for high school. My 10 and 8 year old sons are learning through living each day and are involved in many activities, Legos being one of their greatest passions these days. My two little girls ages 4 and 2 are happy and healthy living and learning in a family that loves and cares for them in a completely cooperative environment. I hope that I can continue to provide the gift of freedom as independent learners to them as they grow. As I said, it has been a journey that has taken 23 years. In all, my children have been officially "homeschooled" for 16 of those. After reading much on the topic and most recently, your writing, I know we have evolved as true unschoolers. We are all teachers as well as learners in life. The difference is made in being given real choices and being trusted with what you choose. It has been a very turbulent path but we have been empowered by the experience and rewarded by our successes. I started unschooling in March so, when I come across stories and articles like this, it strengthens my resolve. Thank you for such an elequent example of great unschooling explination. Fantastically expansive and succinct in the same breath- a great explanation. Thank you so much! Thank you for this blog. it is absolutely wonderful! I have been on the journey towards unschooling with my children for the past 23 years. I began as a "homeschooling" mother of a son who I removed from the public school system because of his inability to conform to their standards. Visit college paper for best papers.